Hungarian Review, Volume V, No. 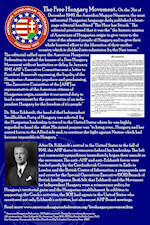 2: Frank Koszorus - "Reflections on March 19, 1944 and Its Aftermath: A Perfect Storm of Tragedy and Folly"
"Reflections on March 19, 1944 and Its Aftermath: A Perfect Storm of Tragedy and Folly"
The American Hungarian Federation's statement regarding the occupation of Hungary by Hitler on March 19, 1944 and its horrific consequences: "We are concerned that a political agenda has replaced a debate based on historical facts relating to the Hungarian Holocaust and Nazi Germany's invasion and occupation of Hungary," said Frank Koszorus, Jr., the Federation's president. "We condemn not only whitewashing but the blackening of this historical record as well. Both forms of revisionism do a great disservice to the memory of the victims of evil and those who opposed it at a treacherous time in Hungary's history. These considerations prompted us to issue our statement," he added. 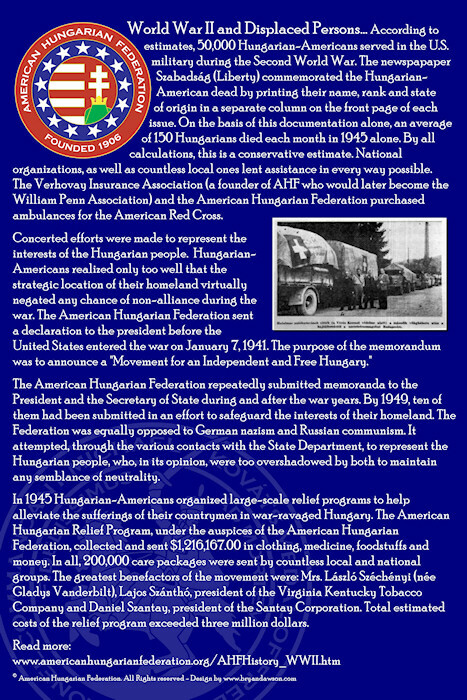 The American Hungarian Federation, representing a cross-section of the Hungarian American community, strongly supports historical accuracy, completeness and integrity. The Federation applauds Hungary for sponsoring Holocaust memorial events during the 2014 memorial year just as it was glad to see Hungary mark the Raoul Wallenberg Commemorative Year in 2012 – events that contribute to a better understanding of Hungary during a treacherous time. Considering the extent of the catastrophe of the Holocaust, great care should be taken to avoid actions that serve no purpose other than to open old wounds and needlessly exacerbate controversies. Care also should be taken to objectively discuss all aspects of a period and not abuse history for political purposes. First, that any attempt to whitewash the catastrophe of March 19, 1944 – when Hitler occupied Hungary – and the ensuing deportation and murder of 550,000 Hungarian Jews or the involvement of Hungarian authorities cannot be tolerated. Second, in order to fully understand the extent of the drastic changes brought about by the German occupation of Hungary on March 19, 1944, one must recall, as noted by Joseph Rothschild, that prior to that date and “to the chagrin and rage of the Radical Rightists, domestic social and institutional coordination with the Nazi model was also diluted by the ruling conservatives. The great majority of knowledgeable commentators and historians agree2 with Professor Rothschild that Nazi Germany occupied Hungary on March 19, 1944. That occupation was not a friendly gesture by an ally just strolling through Hungary, but ordered by an angry and anxious Hitler who intended to keep Hungary from extricating itself from the war, as Budapest had been attempting to do as it negotiated with Allied representatives. Hitler also was outraged by the Kallay government’s adamant refusal to deport Hungary’s 800,000 Jews. As succinctly noted by historian Randolph Braham, a specialist of that period, “[it] was primarily to safeguard their security interests that the Germans decided to invade Hungary. The destruction of Hungarian Jewry, the last surviving large bloc of European Jewry, was to a large extent concomitant of this German military decision.”3 John Lukacs wrote, “[w]hat remained of the independence of Hungary [following the invasion] was largely gone. . . .[and] so war had come to Budapest, physically, in the spring of 1944.”4 Tragically, the lack of adequate preparations by the government coupled with the pro-German predisposition of several officers of the General Staff and senior officers in key positions and a fear of bolshevism were among the factors that precluded any military opposition to the German invasion to defend Hungary’s borders. And in examining the events, it is important to recall the anti-Jewish laws, Kamenets-Podolsk, (halted by Interior Minister Keresztes-Fischer), the Novi Sad massacres (perpetrators prosecuted by the Kallay government) and the labor battalions (whose plight Defense Minister Vilmos Nagy-Baczoni eased and for which he was recognized as a Righteous Gentile). It is equally important to examine why approximately 800,000 Jews remained alive in Hungary in 1944 before the occupation. While fascists, Nazis and pro-German elements may have welcomed the German invasion, thereby betraying Hungary, Hungarian interests and humanity, one must consider how and why they had been stymied as long as Hungary had been able to maintain a semblance of its independence and until Hitler’s invasion. After the war, the war criminals, including members of the Stojay and Szalasi governments, were tried, convicted and executed by the People’s Tribunals in Hungary. Third, the Nazi German occupation had horrendous consequences, resulting in the deportation under horrific conditions and death of hundreds of thousands of Jews at the hands of the Nazi occupiers and their Hungarian collaborators. Both the German and the Hungarian roles must be acknowledged (as Hungary’s ambassador to the United Nations Csaba Korosi did recently), remembered and taught objectively not only for the sake of accuracy, but also to prevent such tragedies from occurring again. Fifth, the Federation further believes that rescue efforts by non-Jewish Hungarians who stood up against evil, such as Col. Ferenc Koszorus who intervened with his loyal troops to prevent the deportation of the Jews of Budapest in July 1944, must not be omitted, denied, forgotten or minimized.8 Such rescue efforts must also be acknowledged, taught and remembered for the sake of historical accuracy and to serve as examples for this and future generations of how one should behave in the face of the barbarism that characterized the Nazis and their collaborators (as well as the Communists). 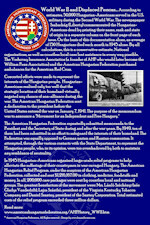 In sum, March 19, 1944 and its consequences are interconnected historical facts relating to one of the most tragic periods of Hungarian history. It can be hoped that politics is not injected into what should be a serious and honest historical debate and a somber, respectful and distinguished commemoration of tragedies that affected and continue to affect so many lives. 1. Joseph Rothschild, Return to Diversity: A Political History of East Central Europe Since World War II (2000), p. 40. 2. Elie Wiesel; Istvan Nemeskurty; Ivan. 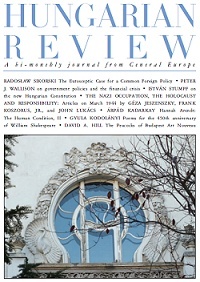 T. Berend; Balint Torok; Gyula Juhasz; Peter Gosztonyi; Janos Horvath; Istvan Csicsery-Ronay; Imre Kovacs; Istvan Domonkos; Elek Karsai; Karoly Vigh; Tsvi Erez; Zsuzsa Hanto; and Asher Cohen to name just a few. Ignac Romsics observed that, “[a]lthough Horthy formally appointed the government [under duress]. . . the cabinet usually did not clear its actions with him but with Edmund Veesenmayer, whom Hitler had sent as Reich Plenipotentiary to replace the German ambassador in Budapest. During his five months in office, Sztojay set about doing all the things that the Germans and the Hungarian right wing had been demanding but which had so far been more or less successfully blocked by the conservative regime. On March 28th he dissolved all parties of the left-wing and bourgeois democratic opposition, including the Independent Smallholders and Social Democrats. During March and April over 3,000 people were taken into custody by the Gestapo and the Hungarian police and gendarmerie. . . . In order to preserve a semblance of legal continuity, the Diet was allowed to carry on functioning but there was a massive clear-out of officials in key positions of the state administration and army command, including 29 of the 41 high sheriffs and two-thirds of the country’s burgomasters.” Ignac Romsics, Hungary in the Twentieth Century (1999), pp. 211-212, (Emphasis added). Under these circumstances Horthy perhaps should have resigned to avoid the semblance of legitimacy as Kallay implored. A Jewish delegation, headed by Ferenc Chorin and Moric Kornfeld, on the other hand, urged Horthy not to resign because, they believed, if he failed to appease the Germans the Jews would face extermination. Deborah S. Cornelius, Hungary in World War II (2011), p. 281. His “decision to remain as regent has been one of the most intensely debated questions among Hungarians ever since.” Cornelius, p. 286 . Since Horthy did not abdicate could he have done more than to protect just the 250,000 Jews of Budapest? According to Charles Fenyvesi “, . . .Horthy as head of state did have enough power to protect its Jewish citizens. . . . Horthy underestimated his freedom of action and overestimated the force of the great power facing him.” Charles Fenyvesi, When Angels Fooled the World: Rescuers of Jews in Wartime Hungary (2003), p. 12. Cf. Veesenmayer’s cable to Berlin on July 13, 1944: “He [Horthy] has no personal influence left whatsoever, which is apparent from his inability to even have Undersecretaries of the Ministry of the Interior Baky and Endre removed." Gyorgy Ranki, Ervin Pamlenyi, Lorant Tilkovszky and Gyula Juhasz, A Whilhelmstrasse es Magyarorszag: Nemet Diplomacia Iratok Magyarorszagrol, 1933 – 1945 (1968), p. 881. 3. Randolph L. Braham, The Uniqueness of the Holocaust in Hungary, The Holocaust in Hungary Forty Years Later, Braham and Vago (Eds.) (1985), p. 185. 4. John Lukacs, Budapest 1900: A Historical Portrait of a City and Its Culture (1988), p. 217. 5. Randolph L. Braham, The Uniqueness of the Holocaust in Hungary, The Holocaust in Hungary Forty Years Later, Braham and Vago (Eds.) (1985), p. 186. 6. Gyorgy Ranki, The Germans and the Destruction of Hungarian Jewry, Ibid, p. 77. It should be recalled that “[w]ith the outbreak of World War II it was clear that Hungary would not be able to avoid being involved in the war. Despite efforts to maintain her neutrality, her geopolitical situation in Central Europe – surrounded by countries either allied with or occupied by Germany – predetermined her participation. The question was whether this participation would take shape as a German ally or an occupied country.… The lure of regaining Hungary’s lost territories [inhabited by Hungarians] combined with Germany’s stunning early successes persuaded many that the restoration of the territories might be won through a German alliance. This belief was strengthened by the fact that Hungarian life maintained a surprising amount of normalcy, even though limited for its Jewish citizens, until the German occupation in March 1944.” Cornelius, p. 5. ”See also, John Flournoy Montgomery (U.S. Envoy Extraordinary and Plenipotentiary to Hungary, 1933 – 1941), Hungary: The Unwilling Satellite (1947). 8. 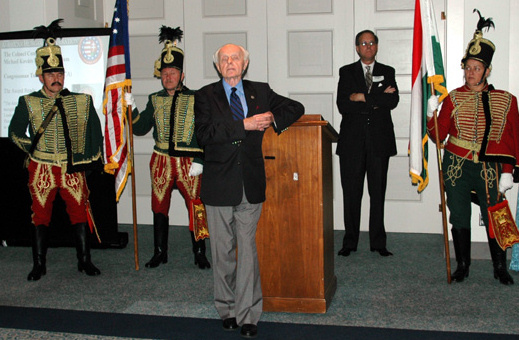 On the 50th anniversary of the Hungarian Holocaust, Congressman Tom Lantos, a survivor of the Holocaust himself and a liberal Democrat who served as Chairman of the United States House Committee on Foreign Affairs, recognized Colonel Ferenc Koszorus: "Colonel Koszorus’ unparalleled action [in July 1944] was the only case in which Axis power used military force for the purpose of preventing the deportation of the Jews. As a result of his extraordinarily brave efforts, taken at great risk in an extremely volatile situation, the eventual takeover of Budapest by the Nazis was delayed by 3 1/2 months. This hiatus allowed thousands of Jews to seek safety in Budapest, thus sparing them from certain execution. It also permitted the famous Raoul Wallenberg, who arrived in Budapest on July 9, 1944, to coordinate his successful and effective rescue mission. "… Therefore it is with great honor and pride that I rise today in recognition [of the] valiant, patriotic efforts of Ferenc Koszorus. Many thousands of families are alive today as a result of the heroic actions of one man who stood up for his beliefs in a very uncertain and dangerous time. His loyalty to his country and love of humanity are an inspiration to all who struggle against oppression and the vile bigotry of racism… Too often the efforts of those who struggle against the Nazi oppression go unrecognized. This year, the 50th anniversary of the Hungarian Holocaust, the world reflects on the lessons learned. I am proud to honor Colonel Koszorus, a patriot, a humanitarian, and a hero." Hon. 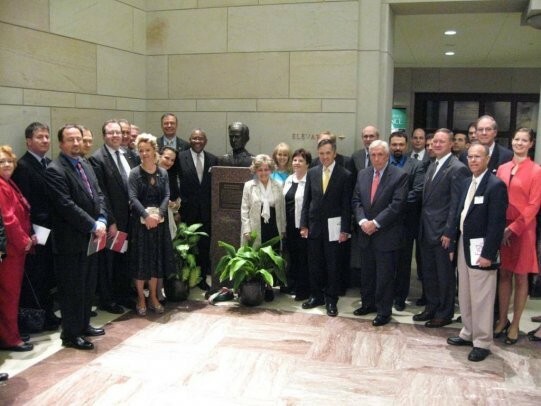 Tom Lantos, Ferenc Koszorus:A Hero of the Hungarian Holocaust, Congressional Record, May 26, 1994. See also The American Jewish Yearbook, Vol., 46, (Ed. Harry Schneiderman), p. 256: “The main current of public opinion failed to take the side of Nazism against the Jews. It proved overwhelmingly anti-Nazi and largely decent toward the Jews.” Other Hungarian heroes include but are not limited to the following: General Vilmos Nagybaczoni-Nagy (who upon being appointed minister of defense by the Kallay government took measures to end the gross abuses threatening the lives of Jews in the auxiliary labor force); Tibor Baranszky (who as secretary to Monsignor Angelo Rotta, the Vatican’s ambassador to Budapest, distributed protective letters to Jews on forced marches and elsewhere); Roman Catholic Priest Ferenc Kallo (who gave Jews certificates of baptism and who was killed by the Arrow Cross on October 29, 1944); Jozsef Antall Sr. (who as a member of the ministry of internal affairs for civilian refugees gave refuge to Jews and Poles); Prince-Primate JusztinianSeredi, Bishop Laszlo Ravasz of the Reformed Church and Istvan Bethlen (who communicated protests to Regent Horthy in 1944 against deportations).